There is no doubt about it. We are like bears, hibernating in the winter waiting for springs lavish colors from nature’s pallet breaking out into full bloom, as the days are longer while enjoying the warmth and glow of sunshine. I remember hearing the voices and laughter as the children in the neighborhood would play outside. With all of the electronic devices and both parents working or being part of a single parent household, the sound of the children outside is a rarity. Advocating for youth, We Survive has been able to bring sunshine to the life to an under-served population through intergenerational connections. I have created programming for all ages for over 40 years. These programs encourage people to believe in themselves and dare to DREAM. I was first introduced to “Sunshine” Joseph Mallard’s artwork in 2005. In November 2006, “Sunshine” Joe was part of We Survive’s month long activities for Hunger and Homelessness Awareness. It all started on November 3, with a tapestry/needle art exhibit. 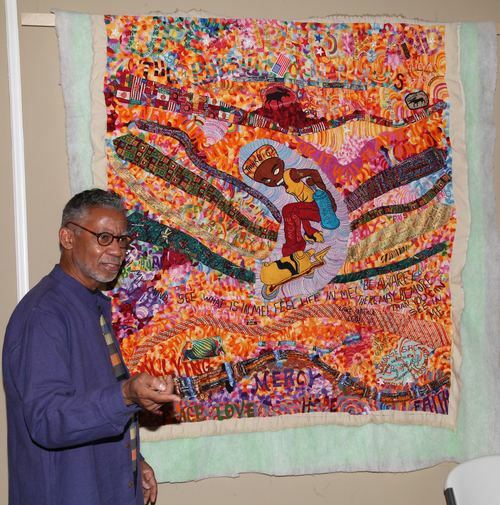 In collaboration with Wayside Christian Mission, “Sunshine “Joe” Mallard’s tapestries were featured at Expressions Gallery (Wayside Christian Mission’s Art Gallery). There were handcrafted items made by Jeffersontown Christian Church—Grateful Threads. Also, items created by clients served by Wayside Christian Mission were also displayed. While on my personal and professional journey, I combined my art and nursing degrees to provide Creative Expression programming which has been an important part of my life’s journey. In 2016, “Sunshine” Joe’s name crossed my path once again. Who could forget his creative ability with his tapestries and his embroidery! Without light, darkness prevails—SUNSHINE is a natural healer and offers HOPE. With a name like Sunshine Joe, this was a perfect re-connect. We Survive would like to invite everyone to be part of LIGHTFEST Re-Ignited “to show your support for the future of America with a Light of HOPE.” By joining this worldwide movement, you will be showing the passion that you have for your community and the world. On November 5, you can send a message of HOPE for LIGHTFEST Re-Ignited 2016, by having a Light-Up Celebration at 6pm Eastern Time, with your family and friends while putting compassion into action. Display some form of LIGHT representing HOPE. It can be a porch light, candle, flashlight or cell phone.